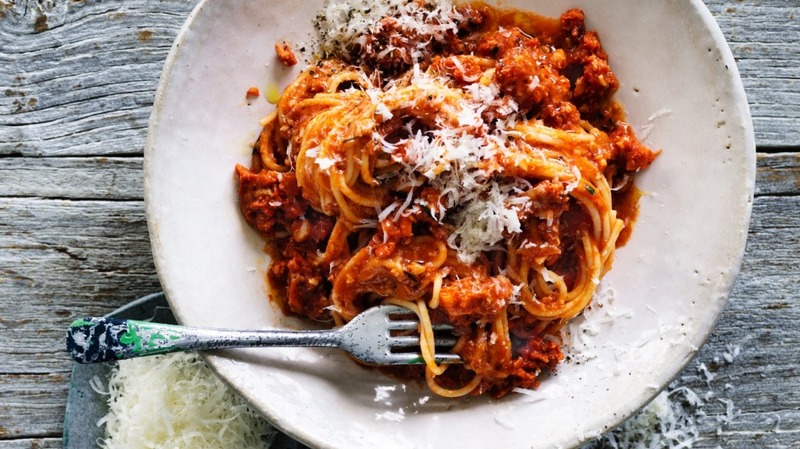 How do you make your bolognese? Beef? Pork and veal? Try it with fish! Finely chop the fish with a sharp knife to create a coarse mince. Heat the olive oil in a medium saucepan over medium heat and fry the garlic and onion for about 5 minutes, stirring frequently until fragrant and translucent. Add the anchovies and fry for a further minute, then add the tomato paste and fry for one more minute. Add the fish mince and stir well to combine. Add the wine, passata and tarragon leaves and stir to combine. Simmer for about 30 minutes, uncovered, until the sauce is thickened and reduced. Keep warm on a low heat while you cook the spaghetti. Heat a large pot of salted water to a rolling boil. Cook the spaghetti until just al dente. Drain very well (reserving 1⁄4 cup of the pasta water) and return the empty pot to the heat. Add the sauce, butter, reserved pasta water, the drained spaghetti and parsley. Mix vigorously until the butter is melted and the sauce and spaghetti well mixed. Grind over some black pepper and serve with parmesan cheese, if you like. Adam's tip You'll get a lot more flavour into your pasta by mixing it with the sauce over heat rather than just dolloping a ladleful on top. This mixing process, known in Italian as mantecare, helps bring any pasta or risotto together.